Run in America! : 5 - 4 - 3 - 2 - 1.... Countdown! 5 - 4 - 3 - 2 - 1.... Countdown! I grew up in the age of NASA's highly successful Mercury, Gemini then Apollo space flights. 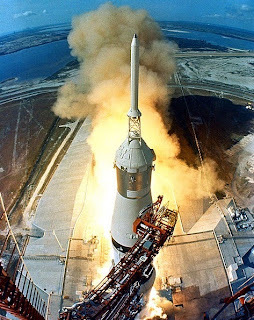 These were always exciting, as mankind's place in space remained a novelty until long after Neil Armstrong first planted his feet on the Moon's surface in 1969, and there remained a - completely justified - edge of danger associated with each launch. It's hard to believe now, but for every manned space flight launch in the 1960's all three major networks interrupted their normally scheduled programming as every American's eyes remained glued to the TV screen, especially as the announcer counted down from 10 seconds until the always spectacular liftoff. With an eye towards those exciting times I gravitated early-on in my marathons' final taper phase towards a similar count-down methodology to determine how many miles to run in the days leading to a race. Thus, beginning five days prior to a race I run five miles, targeting the latter half of the run at or near (i.e. within 45-seconds per mile of) goal race pace. The following day I run four miles, and so on until the eve of the race I run just one mile - to maintain my confidence and to remove the edge of nervousness as the big day rapidly approaches. Have built-up our bodies' muscular strength and endurance in the months' long preparation. Maintain a constant caloric intake with a diet consisting primarily of complex carbohydrates with some lean protein. The countdown approach is both extremely simple and effective - so give it a shot before your next race launch! What a good analogy! I like it! Good luck in the half! Good timing for me. Thanks Mark. I'm going hard on the complex carbs next week. Good luck this weekend.